United States head coach Juergen Klinsmann. U.S. NATIONAL team coach Jurgen Klinsmann took some heat when he made the honest assessment that it was not reasonable to think the USA could win the 2014 World Cup. But that was before the tournament started and his squad faced the daunting task of moving out of a "Group of Death" that included Germany, Portugal and Ghana. Klinsmann, however, also said that once a team gets to the knockout stage of the competition, anything can happen. The United States is in the Round of 16. It finished second to Germany to move out of Group G, and today will play Group H winner Belgium in the last match for a spot into the quarterfinals. On paper, the USA is an underdog to a Belgium team that is one of the youngest but most talented squads remaining in Brazil. But if the World Cup were played on paper, the United States would not be playing today and fellow CONCACAF member Costa Rica would not have a quarterfinal date with the Netherlands, while teams such as Spain, Italy, Portugal and England went home last week. 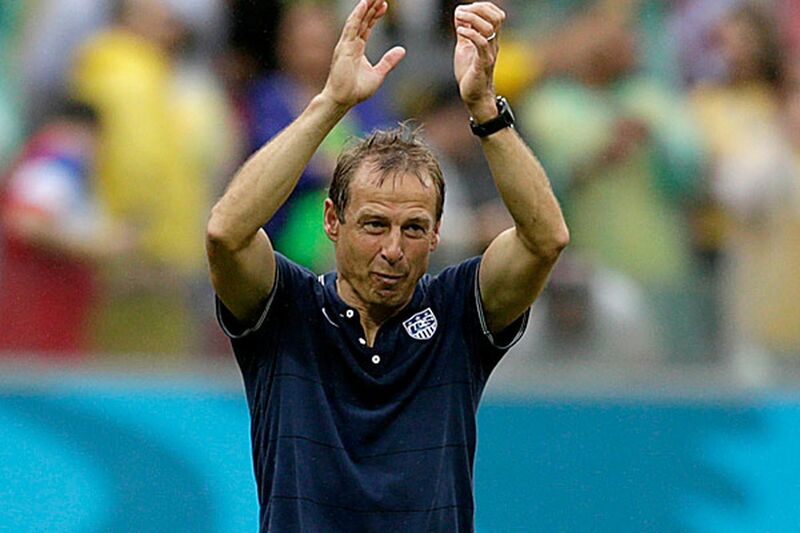 "It's a huge achievement by the team to get out of the 'Group of Death' and to move on," Klinsmann said. "But, at the same time, we already communicated to the team, 'This is all done now. Be proud of it for a second, but don't be content.' "
This is when the inexperience of the roster Klinsmann has assembled can come into play the most. Only six members - Jozy Altidore, DaMarcus Beasley, Michael Bradley, Clint Dempsey, Brad Guzan and Tim Howard - remain from the 2010 team that played in South Africa. Of that group, only Altidore, Bradley, Dempsey and Howard actually played in a World Cup elimination game. Beasley is the first American to play in four World Cups, but if he makes the expected start at left back against Belgium, it will be his first knockout-stage appearance. But as inexperienced as the American roster is, Belgium's is even more. The Red Devils did not qualify for the previous two World Cups, and only 36-year-old Daniel Van Buyten was on the last team to play in a World Cup in 2002, as was the team's current manager, Marc Wilmots. With a roster of young stars that includes midfielder Eden Hazard, Kevin De Bruyne, Axel Witsel, Vincent Kompany and Thibaut Courtois, Belgium won Group H by beating Russia, Algeria and South Korea. The perception is that the Red Devils won possibly the weakest group and have not played that well. Wilmots has been criticized for not allowing the team to find a rhythm, because he has changed the starting lineup for each game. He has used 22 of his 23 players. "I have 23 players," Wilmots said. "It would be stupid on my part not to use them if they are the right ones to select for a particular opponent. "My starting 11 is never the same, because the adversary is never the same sort of team that we faced in the previous match, either." Both the United States and Belgium need to step up their play to move on to the quarterfinals. The Americans need Bradley to step up his form and become the attacking midfielder who adds another dimension to the offense and defense; the back four cannot afford to make any of the gaffes they did during group play. "This is now the key going into the knockout stage," Klinsmann said. "It is about understanding the dynamics of knockout games. That means do or die." The dynamics change in the Round of 16. The tension and pressure build, sometimes leading to dramatic situations. Few would have expected host Brazil to need penalty kicks to squeeze by Chile out of the Round of 16. The Netherlands rose from the dead to score twice on Mexico in the final 8 minutes to advance to the quarterfinals. Tiny Costa Rica won Group D, which featured former champions England, Italy and Uruguay, and then moved to its first-ever quarterfinals by beating Greece on penalty kicks after playing nearly an hour with 10 men. "Is it doable?" said Klinsmann, who was involved in many knockout games as a player and manager for his native Germany. "Absolutely, [the United States] got out of this group, so now anything is doable. "We're going to get everything out of these guys that we can. Believing also that you can compete, because you can. I asked all the players to make sure that all their flights were booked for after July 13." That is after the World Cup final scheduled to be played that day in Rio de Janeiro. That's a very different stance from when Klinsmann said the USA was not ready to win the World Cup. The United States advanced out of the Group of Death and is now in the knockout stage, where anything can happen. That would shift anyone's perspective.